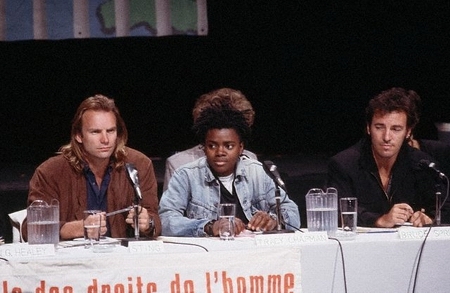 The year 1988 marked the 40th anniversary of the signing of the Universal Declaration of Human Rights. 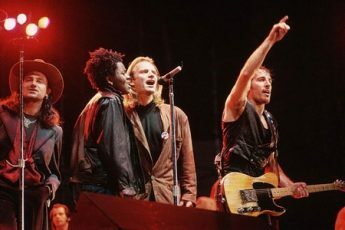 The aim of the Concerts for Human Rights Foundation World Tour, featuring performances by Tracy Chapman, Bruce Springsteen, Sting, Peter Gabriel and Youssou N’Dour at venues in 19 cities from London to Buenos Aires, was to raise world consciousness of humn rights and of the plight of political prisoners world-wide. 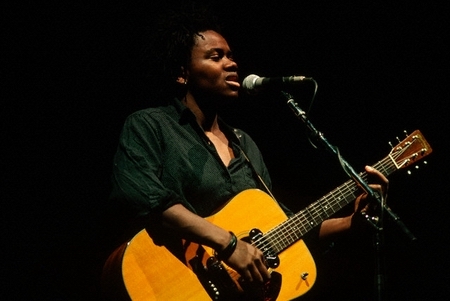 Tracy Chapman performs at Amnesty International’s Human Rights Now! 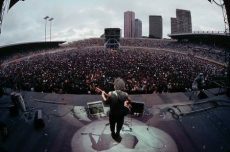 concert at Stade Houphouet Boigney stadium in Abidjan. 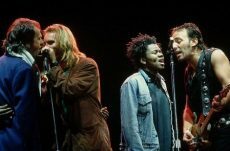 Musicians Sting, Yassou N’Dour, Peter Gabriel, Tracy Chapman, and Bruce Springsteen (from left to right) perform Get Up, Stand Up during the Human Rights Now! 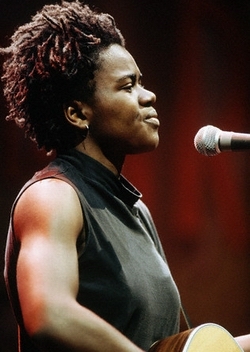 concert tour benefiting Amnesty International. 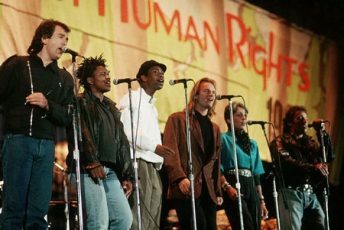 The members of the “Human Rights Now!” world tour sing together in a row at the Los Angeles show. 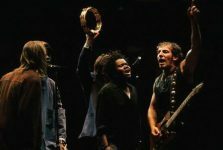 From left, Peter Gabriel, Tracy Chapman, Youssou N’Dour, Sting, special L.A. guest Joan Baez, and Bruce Springsteen. 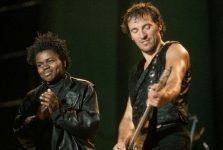 Bruce Springsteen and Tracy Chapman sing together on the Amnesty International “Human Rights Now!” world tour. 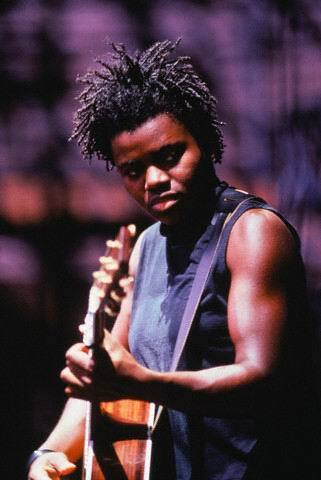 Tracy Chapman, talkin’bout Amnesty and the Human Rights Now Tour: « Like Nelson Mandela, all over the world people are in prison for their political beliefs. I think mostly, people are unaware of that. They don’t think it exists and this is where, maybe this tour is gonna help because they don’t understand really how much simply writing letters and calling people does. 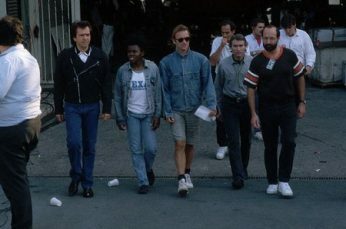 Y’know, it really put pressure on government officials to do what they can to let these people out. 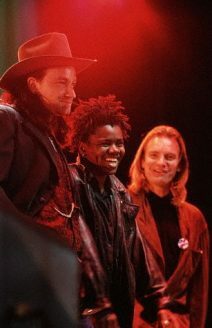 They’re not necessarily individuals who have been politically known, they’re just people out there fighting for what they believe in or voicing their opinion and they end up in jail. 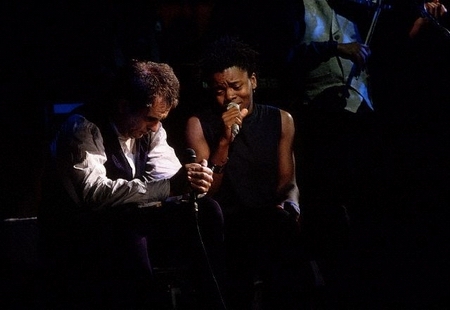 « This tour was the chance of a lifetime –to have performed in the places we performed in and, on top of that, to have it all mean something too. 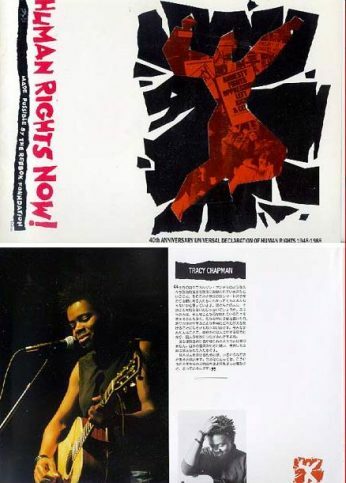 » – From Human Rights Now ! 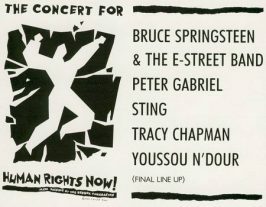 The Official Book Of The Concerts For Human Rights Foundation World Tour, Text by James Henke. 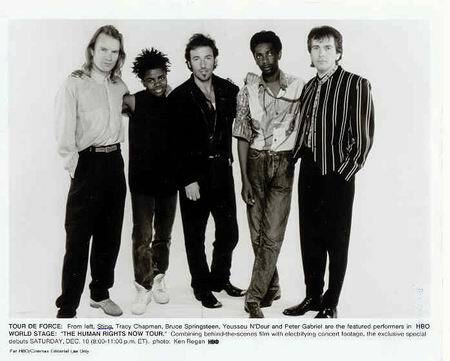 Bloomsbury, 1988. p.24. 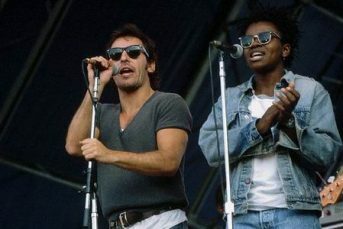 Amnesty 1988 tour – India show news report from Wildandinn on Vimeo.